Our culture bombards us with images of marriage. Pictures and news of celebrity and royal marriages and breakups crowd the pages of magazines and internet sites and capture the attention of millions of people, influencing everything from the newest trends in bridal gown design to values concerning intimacy and relationships. Does the Church hold up any paradigms for marriage to provide the framework for a Christ-centered marriage? Indeed it does. 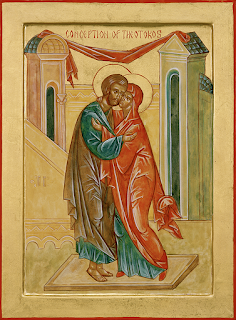 The Church offers three icons from which we can learn how to live the married life: Christ the Bridegroom, Sts. Joachim and Anna, and the Wedding at Cana. These icons represent the three dimensions of marriage, the personal, the intimate, and the communal, respectively. Collectively they give us an Orthodox model for marriage. Living these three dimensions daily is part of the grace and challenge of married life. We have a “personal” life, that is, who we are and who we are becoming in Christ. Yes, we become “one flesh” in marriage, but we do not become “one person.” Husband and wife remain distinct persons in the marriage relationship. Secondly, husband and wife share an exclusive personal and intimate relationship. Finally, the couple lives the married life in relationship with others, not in isolation. First and most important, is the icon of Christ the Bridegroom, who married us, His bride, the Church, supremely through His suffering and death in the ultimate act of love. He offers Himself to us as the perfect model of the perfect spouse. Our initial response to being challenged to love our spouse as Christ loves us might be, “He was God; I am human.” However, to be fully human, in fact, means to be like Christ, by grace, through faith. Let us pause and reflect on Jesus’ humanity. During the three years of His public ministry, He regularly took time to be alone or with his Father in prayer. We also know that He had an inner circle of fellow workers/friends, which began with Peter, James and John and extended to the twelve disciples and a larger group of followers. Additionally, Jesus had other dear friends, most notably, Lazarus, Martha and Mary. Finally, following the natural rhythm of life in His day, we can deduce that Jesus ate a healthy Mediterranean diet and walked a lot. He lived, what we call in contemporary terms, an active, healthy lifestyle. This may seem like a stretch, but we can conclude that Jesus exemplified “healthy, holy self care” in His daily life. He was a healthy, holy person. When He ministered to others through miracles, teaching, and preaching, Jesus acted in love from a place of fullness. He was secure in His relationship with His Father and others (even though many opposed Him), and He knew His purpose in life. Then, in His final act of love for His bride, His suffering and death, Jesus was able to give everything He had, Himself. How can we become a better husband or wife? By living and growing in Christ and allowing His grace to grow in us, so that His love works through us in loving our spouse. None of us is capable of loving our spouse with the perfect love of our Bridegroom. However, by God’s grace and faithfully looking to Jesus as the model spouse, we can intentionally enter into the process of holy, healthy self care through prayer, solitude, worship, learning, healthful eating, physical activity, appropriate rest and leisure, fellowship with others, and attending to any unhealthy habits or addictions we may have. Thus, we will become healthy, holy persons, who, by God’s grace and our cooperation, grow to love our spouses from a place of fullness. The second dimension of marriage, the intimate relationship of husband and wife, is beautifully depicted in the icon of Sts. Joachim and Anna, portrayed as an older couple, tenderly embracing each other. This is the private domain of the couple, which involves how husband and wife communicate with one another, resolve conflict, manage finances, navigate personality differences, parent their children, share responsibilities, make decisions, enjoy leisure, show affection, and share physical intimacy. Sometimes we take these areas for granted and do not seek to grow them. At other times we struggle with them. When these difficulties arise, what do we do? Do we attend to them, avoid dealing with them, or allow them to grow and fester? 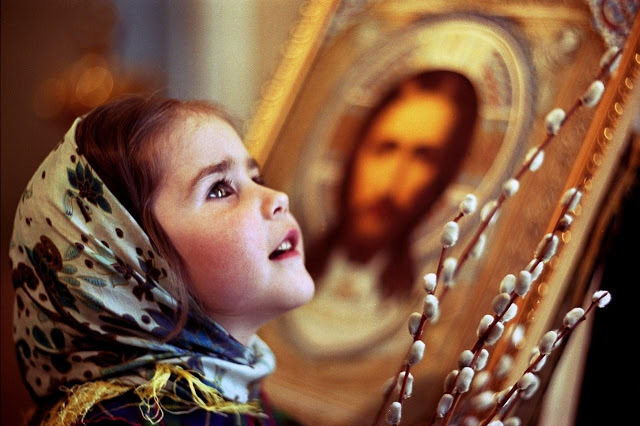 The tenderness and love depicted in the icon of Sts. Joachim and Anna can only come through a lifetime of a dynamic, maturing marriage. The seed of love we begin with in marriage has the awesome potential, by God’s grace and our cooperation, to become a most magnificent flower. If not nurtured, it will wither and possibly die. 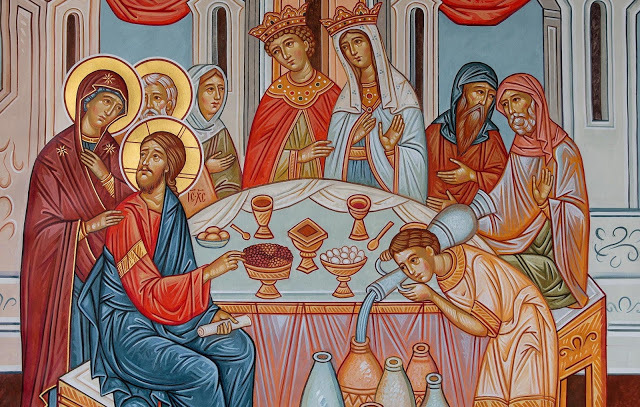 Finally, each couple lives in relationship to “community,” pictured in the icon of the Wedding at Cana, with Christ and the Theotokos as the honored guests. 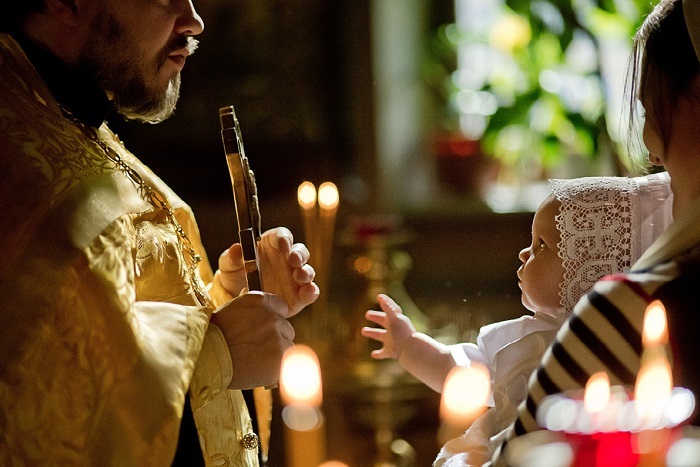 The sacrament of marriage and the celebration that follows are always in the context of a community, showing that we do not live our married lives in isolation but as part of a larger body, which includes extended family, koumbari, fellow parishioners, neighbors, colleagues and friends. If and when we are blessed with children, they become part of the community of the home, the fruit of the love of the husband and wife in Christ. Furthermore, as we live out marriage in the context of “community,” we may be challenged to put other relationships ahead of our marriages. Once we are married, we would do well, however, to remember that after Christ, the most important relationship we have is with our spouse. Collectively, the icons of Christ the Bridegroom, Sts. Joachim and Anna, and the Wedding at Cana encapsulate the meaning of a wholesome and meaningful marriage. 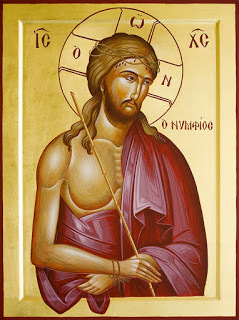 In the icon of Christ the Bridegroom, we are given the image of the perfect spouse who unconditionally and sacrificially loves His beloved from a place of fullness and wholeness, grounded in His relationship with the Father and emulating, in his humanity, personal and relational self-care. This icon holds up for us both who we are and who we are becoming. In the icon of Sts. Joachim and Anna, we are given the image of the tender, loving, affectionate, embrace of the couple, signifying the exclusive intimate relationship of husband and wife. Finally, in the icon of the Wedding at Cana, we see the married couple in the context of all of those who constitute the communities in which they live, reminding us that in marriage we do not live in isolation and that we are responsible to hold up marriage as the primary human relationship in our lives while maintaining and growing loving relationships with others.